Happy Solemnity! Even though it’s Monday and most of you have to work, we hope you will find a way to celebrate Our Lady’s Immaculate Conception today. 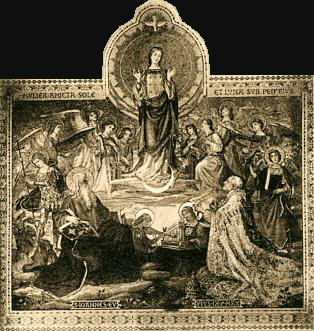 The Immaculate Conception is the patroness of the United States, and she is also the patroness of our order, the Poor Clares of Perpetual Adoration (our order was founded on the very same day that Pope Pius IX defined the Dogma of the Immaculate Conception – December 8, 1854). We’re very excited to share a fantastic talk about Our Lady, given by Fr. Donald Calloway, MIC. We heard this talk live at the Fullness of Truth Conference in San Antonio in August. We loved it, and we think you will, too. As an Advent gift Fullness of Truth Evangelization Ministries has made five talks available for free download. Please pray for them and their success. It’s been a huge blessing to attend the San Antonio conferences since we moved here, we learn so much from every speaker. If you’d like to hear more wonderful talks like this, click here. This entry was posted in Advent, Our Lady, Uncategorized and tagged Advent, Fr. Donald Calloway, Fullness of Truth Conference, Immaculate Conception, Mary, Our Lady by texasnuns. Bookmark the permalink.